Another quickie using this weeks sketch at SCS. This is a new stamp for me from Art Impressions, I colored with copics and the paper is from DCWV. Now this fella sure looks like he's ready for business! Perfect card for your own warrior. Thanks for sharing this with us at Try Stampin' on Tuesday. Hope we will see you again soon! Take Care and Happy New Year. Adorable card! Such a fun image and sentiment! Thank you for playing along at IK IKEsWORLD CHALLENGES. Love the image with the sentiment. I have a weekend warrior but I think he went on several months leave! Good luck in the challenge and Thank you for joining us at the: http://7kidschallengeblog.blogspot.com. What a great card! Excellent mood! Thank you so much for joining us at Party Time Tuesday! I love the AI stamps and this guy is just great. They always give me such a good laugh. Thanks for joining us at Try Stampin' on Tuesday this week! This is a great card. Can you give me clear supply list. Im not sure what the products are just by initials??? 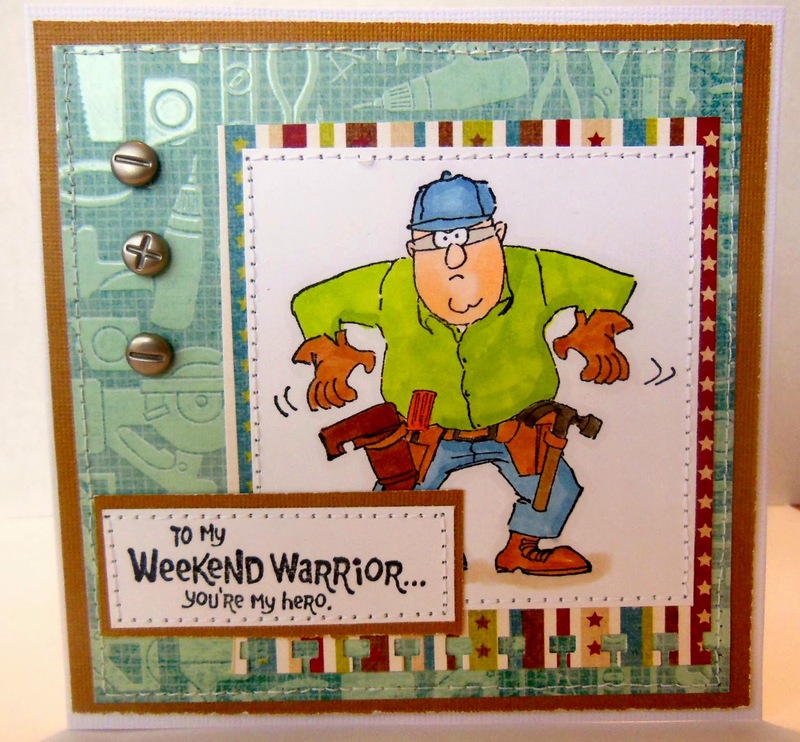 This is such a fun masculine card and a great way to encourage our special man. :) Thanks for joining us at Try Stampin' on Tuesday.